Legislative Gridlock – A Natural Firewall Protecting Citizens from Bad Government | Virginia Right! How many times did the debate moderator, the senile Charlie Rose et al refer to the paralysis in Washington, DC? Rose and the other moderators seem to think this gridlock is a bad thing. Well, it’s not. And it is by design. To use a network terminology, the gridlock is an intentional firewall designed to protect Americans from government. And it has worked well, until recently. Harry Reid has constantly poked holes in the protection scheme that the founder installed. And as a result, our nation has suffered a breach in security. And the result is as expected – bad. Gridlock (or paralysis) is always seen as a bad thing, something to be “fixed” by taking some type of action. 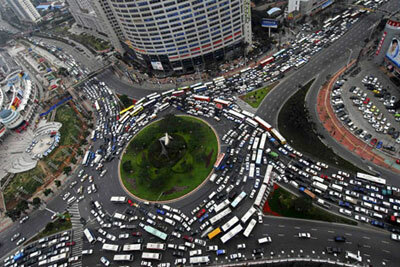 When you are dealing with traffic, gridlock is usually caused by too much traffic going in different directions. You either need to build more roads, or force the traffic to go in the same direction. The same is true of legislation. When nearly half of the Senators and Congressmen are going in opposite directions, there is a massive collision of ideology, and nothing gets done. But nothing should be done when we are this deeply divided. That was the intent of the founders. Most things in the House are decided by a simple majority. Knee jerk legislation and really bad ideas were intentionally allowed to escape the chamber and head to the Senate. But the Senate was designed to be the anchor that drags the Ship of State to prevent sudden and unwise changes in either direction. Or reverse! The Senate is supposed to be the firewall that keeps bad things from happening, most of the time. Now when one party has a super majority, as the Democrats did for the first two years of Barack Obama’s term, there is no firewall. As a result, far left wing legislation was allowed to infect America. By design, when Americans are united in purpose enough to elect a super majority of one party or another, the logical assumption would be that most of us are traveling in pretty much the same direction, so firewalls are not necessary. And normally that is true. But the election of Barack Obama is the exception. A perfect storm of a media infatuated with Obama to the point that they were, essentially, part of the election campaign. A really poor Republican candidate that managed to pick the most controversial Vice President in history, and an electorate convinced that it was time America elected a black man as president, no matter what. And when Americans sobered up and saw the massive regulations, class warfare, and divisiveness that this man and the Democrats reined down upon America, the firewall was turned back on at the first opportunity – in 2010. ObamaCare, Dodd-Frank, and a massive desire to raise taxes on the jobs producing sector forced people to realize that they were fooled. Unfortunately, this was a mistake that will take exactly 4 years to remedy in it’s entirety. And the best that could be done was to erect a firewall until we can replace the Progressive hatred and ambition with something better. The problem is, the thing that now seems better, Republicans, is the precise thing that sparked voters to run towards Obama in the first place. That is a bit scary for a lot of people, but there is hope. As much as the Progressive left has tried to demonize the TEA Party, the fact is, they have actually had a powerful effect on the Republican Party. Most people realize that the founders got it right. And that is the guiding force behind the TEA Party. But the Republicans, if the voters see fit to entrust them to fix the mess that the Progressives have made, will need to adopt similar tactics to repair the damage done by dropping the firewall. Should the Republicans have a super majority and the White House, rolling back the damage of the Obama years will be easy, although the Progressives will squeal like little girls. But should the voters not see fit to grand Republicans a super majority, then the Republican Leadership will need to gather their collective cajones and use the tactics Nancy Pelosi and Harry Reid used. Change the rules. And the next president will need to use the same pen Obama has used to bypass the firewalls and enact legislation from the Oval Office through Executive Orders and the misuse of various agencies like the EPA and the National Labor Relations Board. And once the damage is reversed, legislation must be enacted to place the firewalls up forever and stop the abuses of power from the White House once and for all. Gridlock never happens when 70% or 80% or more agree. It is just when we are 50-50 and going in opposite directions that Congress grinds to a halt. Mercifully! Let’s embrace gridlock. If we are in such disagreement, doing nothing until we can agree is the best action. And compromise is not agreement.